I love to golf. If you walk while you golf, it's great exercise. Even if you're only playing nine holes, you can still get some great exercise if you walk instead of ride. 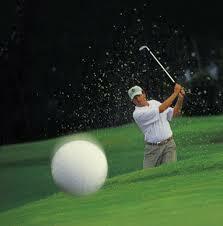 If you're not a great golfer, then you may get extra exercise as you chase your ball through the woods. If you drive around in a golf cart, then you're really missing out on achieving your 10,000 steps a day. I try to walk whenever I can to achieve as many steps each day. Now that the weather is warming up, it's time to get my golf clubs out so that I can enjoy a break. I think it's time to look into some Golf Vacations! I love to golf along the beach. Nothing beats the cool breeze, the ocean, and a great game of golf. One of my favorite spots is Myrtle Beach. It's been a while since I've been there, but I love the fact that it isn't too crowded. Arnold Palmer created some incredible courses out there. The scenery is so pleasant that you actually enjoy walking through the golf courses. Why ride if you can walk? A few years ago, I had a bad case of golfer's elbow (medial epicondylitis). Then, I developed tennis elbow (lateral epicondylitis)! I think it's time for a relaxing vacation. Sometimes you may find some great deals on some Golf Packages. Make sure to send me a tweet on Twitter if you find one!